Kandy General Hospital is the second largest tertiary hospital in Sri Lanka catering to a very wide range of medical and surgical needs. In addition to direct admissions the hospital receives transferred patients from seven out of the nine provinces of the island. Many of the patients are critically ill and require urgent treatment. This includes all trauma patients, acute medical, peadiatrics, and obstetrics conditions. According to the current concept of ‘the golden hour’, the Emergency Treatment Unit of the hospital plays a major role in treating acutely ill patients and in giving them a second chance in life. Around 100 patients enter the Emergency Treatment Unit every day. 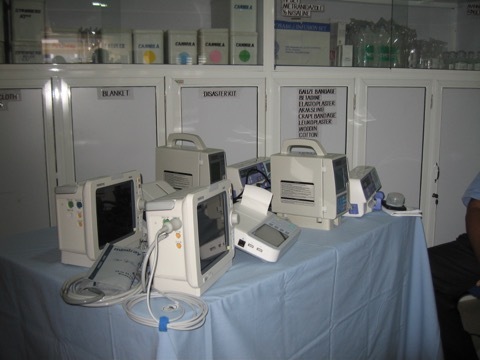 In 2016 Project Sri Lanka made a substantial donation of much needed equipment to the Emergency Treatment Unit, a project organised by the Rotary Club of Kandy. The equipment included two heart monitors, two ECG machines, two syringe pumps and two infusion pumps. It was handed over to the hospital Director, Dr Ratnayake by the Chairman in a ceremony attended by Charity Trustees and Rotarians from Kandy including Senior Vice-President Shamil Peries and the project Chair Dr Ajay Jayaseelan.